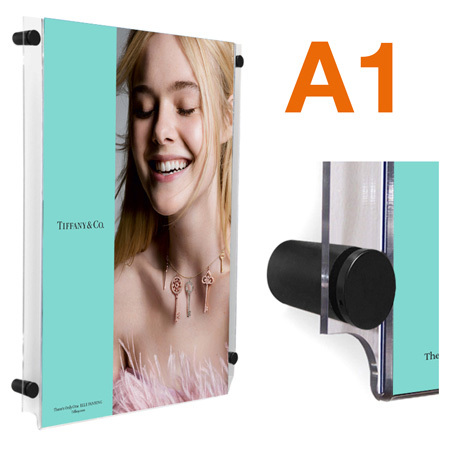 The 3mm thick A1 wall mount poster holders with black stand-off sign fixings are an attractive and modern way to display large posters and artwrok prints in galleries, receptions and showrooms. The black wall mount sign fixings project the pocket 18mm from the surface of the wall giving the panel a contemporary 3D look. What size is A1 and do you supply other 'A' size pockets? A1 measures 594 x 841mm. Our pockets are available in both portrait and landscape orientation which can be selected from the drop-down menu when ordering. 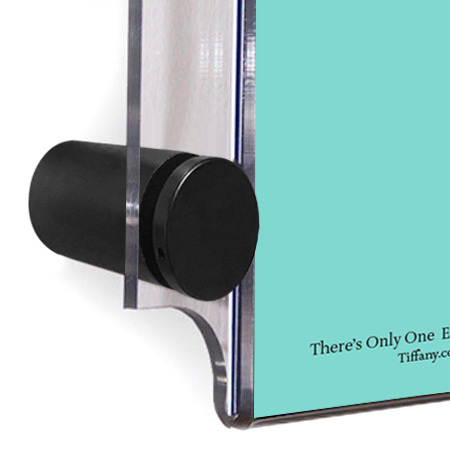 Choose from our other popular sizes including A3, A2, A1 and A0. We do! 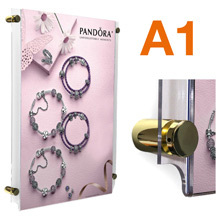 We sell the popular 'A' size pockets with SATIN SILVER, POLISHED CHROME and BRASS sign supports.